Most times when photographers shoot pictures, they work hard to get the exposure correct so that their images reflects what they saw in real life. At times, though, I deliberately over or underexpose for effect. In an earlier post, Creating Blackgrounds, I discussed how to use underexposure to create dramatic black backgrounds. Similarly, you can use overexposure to create other specific effects. For example, overexposure can create a light, dreamy, impressionistic atmosphere. Edges blur, colors soften, and a light background fades to white. The subject is enveloped by light. 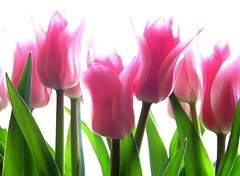 The tulips here look soft and delicate, even though their petals and leaves are firm. The pastel colors suggest spring, new growth, and freshness. A different exposure might have captured the shapes more clearly, but the effect would have been totally different. Bright light has certain connotations beyond luminosity. Light also suggests wonder, spirituality, and life itself. Phrases such as “see the light” and “the light of my life” reflect these implied meanings, which carry over into images. For example, look at the picture by John Watson of the child looking out a window. It is titled “Traveling,” and it manages not only to record a scene but also to convey the wonder of travel. Overexposure helps carry this message. The use of light to obscure what lies outside the window suggests that it is the experience that matters more than the specifics of any particular scenery. The technique of overexposure is simple: select exposure based on the darker parts of the scene rather than on the lighter ones. The tulips were shot using a point-and-shoot camera set on automatic. If I had focused on the blossoms, which were sunlit, they would have been exposed properly and the stems would have been obscured by darkness. To overexpose the flowers, I aimed near the dark base of the stems. Then I locked in the focus and exposure and raised the camera a bit. It looks as if John used a similar technique, since the heater and the child’s back are perfectly exposed. Those details were not in direct sunlight, so by exposing them correctly, everything that was in direct sunlight–the window and the child’s hair–were overexposed. I don’t really believe that any scene has one “perfect” exposure. Exposure is really only perfect for a particular shot. Make it work for you. Sometimes you will want everything crisp and visible. However, at other times you may want that brilliant glow that overexposure provides. Try it yourself. Choose a subject near a clear light source and deliberately overexpose it. Discover the difference between blowing out details you were hoping to capture, which counts as a mistake, and overexposing purposefully to create a magical mood.